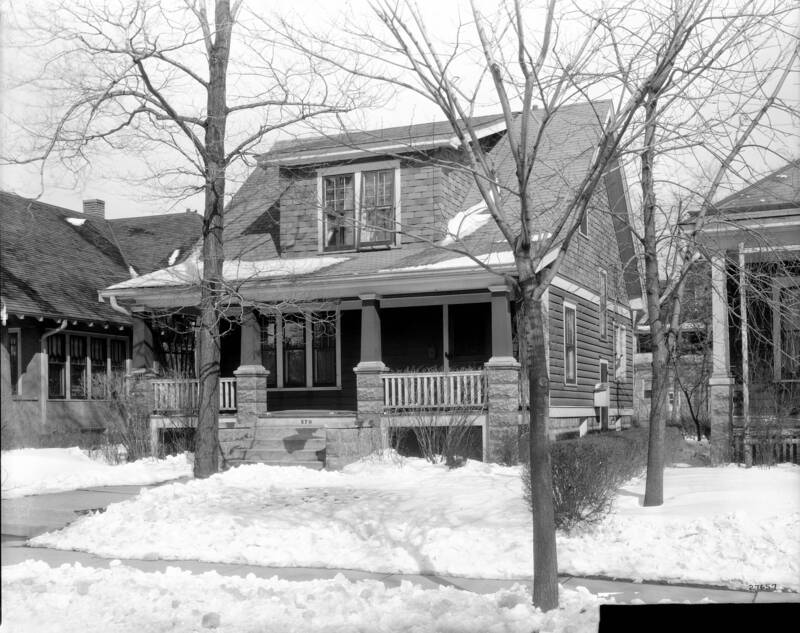 Johnson’s Woods is a residential neighborhood in the City of Milwaukee between Interstate 94, the Hank Aaron State Trail, Seventieth Street, and the Wood National Cemetery. It is named for James Johnson, who purchased 141 acres of wooded land in the area in 1876. The land was part of the Town of Wauwatosa at that time. Johnson was an alderman, a Milwaukee school board member, and Milwaukee’s first health commissioner. He lived in Yankee Hill and held Johnson’s Woods as an investment. The land remained in the Johnson family for three generations. Johnson’s Woods became very important by about 1900. The Village of Wauwatosa, to the north, secured a city charter from the State of Wisconsin in 1892 and expanded east to Sixtieth Street and south to Wisconsin Avenue. Then, in 1902, Allis Chalmers opened its new industrial complex on one hundred acres of farmland at Seventieth Street and Greenfield Avenue. The Village of West Allis incorporated that same year. Johnson’s Woods was between these two fast-growing municipalities. With more than 3,200 workers, Allis Chalmers became one of Wisconsin’s largest corporate employers. Johnson’s Woods was an ideal location for the workers to build homes. Johnson’s Woods was still part of the Town of Wauwatosa in the early 1920s, but the City of Milwaukee annexed the land east of Sixtieth Street in 1925. The city expanded west to Sixty-Eighth Street in 1927 and to Eightieth Street in 1931, taking all of Johnson’s Woods with it. City services, including paved streets and running water, soon followed. Luther Burbank School opened in 1931 and replaced military-style barracks that were used as a temporary school. Solomon Juneau High School opened north of Johnson’s Woods in 1932. The city purchased a large, grassy playfield, which adjoins Burbank School, in 1928. A softball field, wading pool, field house, and outdoor theater were constructed there in the 1930s. The neighborhood began to change in the 1950s, when Milwaukee County razed a strip of city blocks at the northern edge of Johnson’s Woods to build Interstate 94. After that point, the interurban rapid transit rail line, which was the neighborhood’s southern border, became less popular and eventually shut down. The Hank Aaron State Trail, a bicycle trail, now runs where the interurban did. Another major change occurred in 1987, when Allis Chalmers went bankrupt. A significant number of Johnson’s Woods residents lost their jobs. Many Allis Chalmers’ workers moved on to other employment and other neighborhoods. ^ Frances Beverstock and Robert P. Stuckert, eds., Metropolitan Milwaukee Fact Book: 1970 (Milwaukee: Milwaukee Urban Observatory, 1972), 121; City of Milwaukee, “Milwaukee Neighborhoods” (May 2000), last accessed December 21, 2015. ^ John Gurda, Milwaukee: City of Neighborhoods (Milwaukee: Historic Milwaukee, Inc., 2015), 108. ^ Carl Baehr, Milwaukee Streets: The Stories behind Their Names (Milwaukee: Cream City Press, 1995), 164. Baehr, Carl. Milwaukee Streets: The Stories behind Their Names. Milwaukee: Cream City Press, 1995. Beverstock, Frances, and Robert P. Stuckert, eds. Metropolitan Milwaukee Fact Book: 1970. Milwaukee: Milwaukee Urban Observatory, 1972.